If your looking for an affordable personal care home with modern features and a caring staff in a beautiful setting, then your search ends here. Grand View Manor is a medium size facility that offers the personal touch of a smaller home with the outstanding benefits of a larger one. As a family owned business, we take pride in the appearance and operation of our facility. 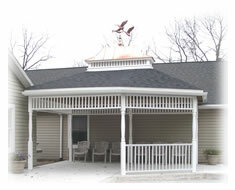 Grand View Manor is located in a country setting with easy access from both the Reading and Allentown areas. Set atop a hillside, a majestic view of farmlands and mountains compliment this exceptional facility. Sometimes the most important thing to our residents is to experience the beauty that nature provides right outside their window. It is not unusual to see 12 deer grazing behind the facility or a flock of wild turkeys walking by. Personal care provides a safer environment for seniors than they would experience living at home. In many facilities there are no medical services provided by the facility itself. Instead, outside professionals are contracted by the residents to provide medical treatment such as physical therapy. Even though the state of Pennsylvania does not mandate that there be advanced medically trained staff on duty, Grand View Manor believes that it is extremely important that residents be monitored daily by someone who understands the delicate balance of medications, diet, exercise and social interaction that seniors need. Therefore, our administrator is a board certified RN who is also licensed to train staff members in both CPR and First Aid. The facility you choose becomes the new family for your loved one. Grand View Manor takes care in choosing staff and evaluating our residents to be certain that they are where they belong. It is this family environment that makes the difference. Big corporations can spend money on advertisements that claim they care, or provide activities that most residents don't participate in or promise a homey environment, but most larger facilities are staffed by 9-5 administrators who are compensated for keeping the facility full. Small facilities, on the other hand, don't provide many of the services or amenities and medically trained staff that are a normal part of Grand View. Many of our residents experience a level of dementia that would normally require them to be transferred to a long term care facility. However, with Grand View's Advanced Care Unit, a higher standard of living can now be achieved. Residents in our new unit experience all of the benefits of an independent living environment with all the safety and security of a high priced alzheimer unit. Friends and family who have developed a connection with the residents and staff at Grand View can now continue these relationships. We welcome you to come see for yourself the Grand View difference. Talk to the staff and residents and make an informed decision.